What’s new in Blackboard for 2017? We’re now running the latest version of Blackboard – the Q2 2017 release. Here’s what’s new. We’ve moved to Blackboard’s new theme. This enables responsive design for content areas, plus select tools, so they will scale down to smaller screen sizes. As a result of the new theme, unfortunately Blackboard no longer supports individual course themes. Any courses which had set their own theme have been reverted to the default. In addition to the new theme, there are updated icons to match those found in Blackboard’s mobile and tablet apps. From this year, staff and students will have access to the Blackboard mobile apps. Keep an eye here and on the Blackboard Welcome Page for announcements of when they’re available. Previously, Aston used a third party tool to generate submission receipts for Blackboard assignments. Receipting functionality is now built into Blackboard. When a student submits to a Blackboard assignment, they are shown a submission ID and receive a copy via email. The third party receipting tool from previous years has been switched off. If this was left on, students would see two different receipt IDs when they submitted work to a Blackboard assignment. Note The behaviour of Turnitin assignments remains unchanged. Staff and students can now drag and drop files into more places on Blackboard, including adding an attachment to a content item (shown above), and creating entries in blogs & journals. Look for the thick dotted line. If your browser allows, you will be also be able to drag a folder of files, with each file within the folder uploading individually. 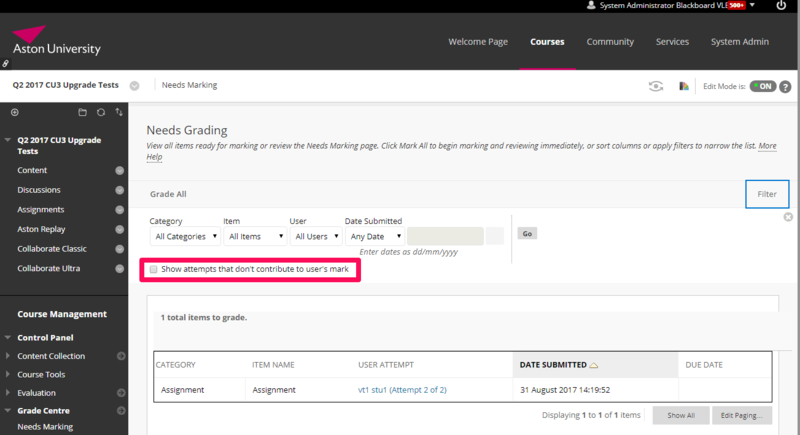 When marking Blackboard assignments which allow more than one attempt, the Needs Grading view will hide attempts that won’t contribute towards the student’s grade. Eg if a student submitted work to an assignment, realised they’d attached the wrong file, then submitted a second attempt with the correct attachment. You can override this by clicking the checkbox on the needs grading view. Students who don’t submit to a peer assessment are now excluded from the evaluation process. This is a welcome fix, one which we documented over three years ago. There are many other fixes, including one which prevented students from accessing their course materials under certain circumstances. More detailed information can be found in the feature lists for the the Q4 2016 release (which we didn’t upgrade to during the 2016-17 academic year), and the Q2 2017 release. Highlighting some other new features, not part of today’s upgrade, which were announced over the last few weeks.